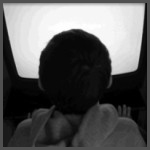 True or False – Sitting too close to the TV can damage your vision | Was Mom Wrong? I would almost be willing to wager that every single person reading this post has at one point in their childhood been instructed by their mother or father to back away from the television set, or risk going blind. It has long been thought that sitting too close to the television can damage vision. Turns out mothers and fathers aren’t the only ones who believe this falsehood. I came across one study that reported even teachers and school children in Pakistan believed that watching television can damage vision. It is true that many years ago some referred to the television as the radiation box. Prior to 1968 televisions did emit low levels of x-rays, but I couldn’t find any studies linking television watching, even back then, to eye damage. The television sets of today do not emit x-rays or any radiation. So, watching SpongeBob up close on Saturday morning won’t damage your child’s vision, but most eye experts agree that it can cause eyestrain. Signs and symptoms of eyestrain can include red, itchy, burning, watery eyes, as wells as blurred vision. These signs and symptoms may be uncomfortable, but will usually subside or disappear in an hour if one stops watching television. Think about adults who stare at a computer screen up close for far too many hours a day. I’ve found no evidence that would suggest this cause’s eye damage either. The American Academy of Ophthalmology even reports that many kids can focus on close items better than adults. Watching television doesn’t damage vision, but research has shown (Toyran et. 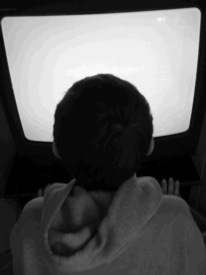 al, 2002) that too much television viewing contributes to obesity, headaches, back pain, and sleep problems. It’s probably a good idea to stay at least 5 feet back when watching television, and if you notice your child inching closer to the set take them in for an eye exam as that could be an indicator of nearsightedness. Toyran M, Ozmert E, Yurdakok K: Television viewing and its effect on physical health of schoolage children. The Turkish Journal of Pediatrics (2002), Vol. 44, pps 194-203.